Scared of scales? Puzzled by progressions? Across this month's huge cover feature, you'll get to grips with the musical techniques behind 13 essential genres, as we break apart the tricks and tropes behind each. Check out one of this issue's 20 videos below, and pick up the whole lot with your copy of CM246! We love huge software giveaways here at CM, and this month's is massive – Ignite VST's Areena is a commercial reverb plugin sold for $49, but we've blagged the full version as an exclusive giveaway for readers of CM246! Areena is an algorithmic reverb plugin in VST and AU formats, with Plate and Room algorithms to put your sounds in the perfect space. You can find out more about Areena and see its full spec on our dedicated Areena page. Earlier this year, DJ Alex Ross dropped his debut single, a cover of Gabrielle's fondly-remembered UK R&B classic Dreams on Ministry of Sound, complete with vocals from Dakota and the king of Auto-Tune himself, T-Pain. We caught up with Alex in his attic studio to find out his production secrets, and to discover how he employed T-Pain's vocal in the track. You can check out part 1 of the video below, and get the whole thing only with your copy of Computer Music 246! Native Instruments' Reaktor is a limitless production platform fit for creating almost anything – so much so that NI have created their own range of Reaktor-based instruments and effects. This issue, we're exploring chart-topping instruments like Form, Flesh, Prism and Kontour, and getting modular with Reaktor's Blocks. Check out the video below for a taste of this feature, and get the rest with CM246. 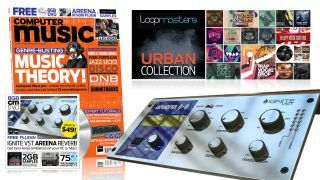 Sample company Loopmasters are one of the biggest names in samples, and this issue sees them drop the 2GB Urban Collection, chock full of samples from some of their best packs. Grab this massive pack – along with an Ableton Live project file making use of the samples, and a video walkthrough – with CM246. Get your head around the science of hearing, and pick up some valuable production strategies along the way with this eight-page feature. Over six videos, we'll show you the knowledge you need for sonic positioning, layering and loudness, all in real musical contexts, without the need for notebooks and calculations. Check out the video below to get your brain moving, and get the rest with CM246.